I am going to address a pet peeve of mine. I see so many ads on our local yardsale groups and sites like CraigsList that say “I don’t want to take him to the shelter but need to rehome for (insert reason here).” Here’s what I have observed. Most of the folks that get the dogs from a shelter are getting the known facts from the shelter who go based on what they observe rather than what they are told. They have observed the dog in multiple situations with different types of people. They work with the adopters to find the right fit and to make the adoption a success. Then we see them in our classes, in private sessions and in the group walks we host. We take the phone calls and provide problem solving suggestions or set up evaluations and treatment plans. When we see a dog “rehomed” in order to avoid the shelter we often see the same dog advertised multiple times in a period of months. Each advertisement is usually a variation of “don’t have time, not fair to dog and don’t want to take to the shelter”. Then this dog goes to a new home with high hopes that are quickly dashed when the new owner has no knowledge of his or her non-housetrained, barking, nipping, digging, jumping, chewing behavior that becomes worse with each rehoming as the dog’s anxiety levels grow. Because the dog is rehomed with little vetting of the new family the dog is a bad fit and is quickly rehomed again with another version of the “don’t have time, not fair to dog, don’t want to take to the shelter” ad. I have seen the same husky rehomed at least 5 times on the same site. I’ve seen the same dog advertised one site after another. And sadly, the more the dog is rehomed with the same lack of vetting and lack of honestly in the dog’s situation, the chances for success are slim to none. If you have made the decision to rehome a dog you owe it the best chance possible. This is with a shelter that has a caring staff that would prefer to see the dog sooner, with fewer issues that need to be worked with, than later when they dog is older, less marketable and has a lot more baggage. Each dog that comes in captures their heart and they try their best in order to get that dog the right home the first time. Most of my friends know that I deal with several illnesses. I won’t go into all the gory details as I don’t want them to define me. I will say I scream at them, I medicate them, I exercise them, I deny them and I bury them. And somedays they attack me with no mercy. Today has been one of those days. My motto: It is what it is. The reason that I bring this up (I promise that I am not going to turn this blog into a woe is me blog) is that today I received a packet in the mail from our insurance company. Hubby is retired military and while it has some kinks in it, for the most part it is the best insurance a person can have and I do appreciate it. Someone, however, needs to work on their customer service. The packet I received was all about disease management and that they are assigning a case worker, a registered nurse, to be my case manager. This person will oversee all care related to the disease. Ok, fine, I can understand that part. A little Big Brotherish but, hey, I can accept it. What got my goat, tho, was in the letter they advised me to put my wishes into an adanced directive (living will). Now, don’t get me wrong, I already have one. And I won’t go into the details, this is a private thing between myself, my husband and God. My extended family is also aware of what I want so there should be no arguments or ‘what if’ questions. However. Having the insurance company tell me they have assigned me a case manager to manage my disease and that I should institute an advanced directive is creepy to say the least and conflict of interest to say the most. It made me very uncomfortable. I absolutely love training dogs. When the dog “gets it” and you see that a behavior has clicked, the dog’s attitude shifts to one of pride, as does their human. And suddenly they are energized and ready to work on the next behavior. For me, this is the defining moment of why I do what I do. The above is why I continue to learn, to make changes in my approach both to the dog and to his human. They should receive the best education I can provide. Whether its the simple sit or an approach to a problem behavior that needs to be addressed. 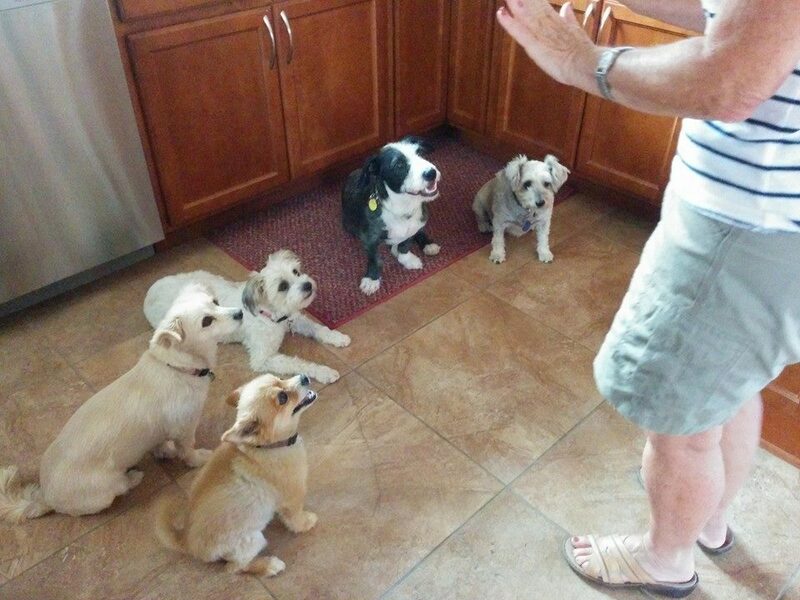 Yes, I have experience in dog training for a few years now. For some reason that experience is the item that most future clients focus on. Believe me, experience is important, but only if you are experienced at doing the best job you can while continuing to improve your methods. Otherwise you may be experienced at doing it wrong and, because it feels safe and comfortable, you continue on that tired old path. This was brought back to me in a Primitive Birth Control These methods vary from using shots of mercury to securing alligator dung and using it as a diaphragm. Folks were very experienced at using these methods and they taught others to use these methods. This is a point where I have point out that experience was not a plus. This is an extreme example but I think it makes the point. Experience is not always best. Progressive Reinforcement is constantly learning, reaching for the better method that is based in science not theory. Constantly challenging myself to continue to learn and to balance that learning with practical experience. I am so proud of these dogs and their human. They are working hard to learn new behaviors to replace older, unwanted behaviors. It’s hard to say “diet” and stick to it. If you call it a diet it sounds like you are sacrificing every good bite of food to never be enjoyed again. We are trying hard not to think that way. We are trying look at lifestyle changes that are incorporated into our lives. No one food is out…it just has to be enjoyed differently, and something has to be traded out for it. Can he still have a beer? Sure….just not with a high carb meal. 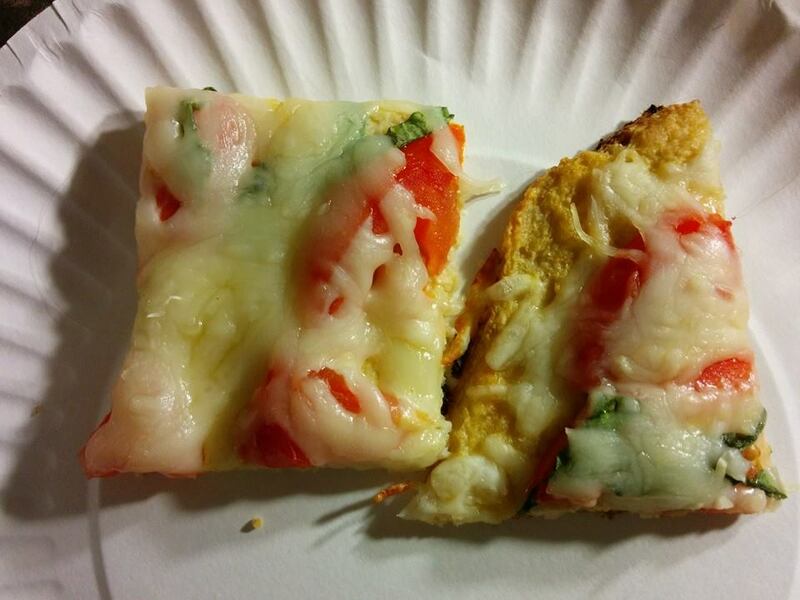 Last week we went to Rocky’s Pizzeria, our favorite local pizza place. Thin crust, greasy, lots of bad for you stuff. We decided to go at lunchtime, when you can order a 1 or 2 piece special. We each ordered one slice of pizza. And we used knife and fork and those pieces last 20 minutes. 20 mouth water minutes. Tonight we made our own pizza. 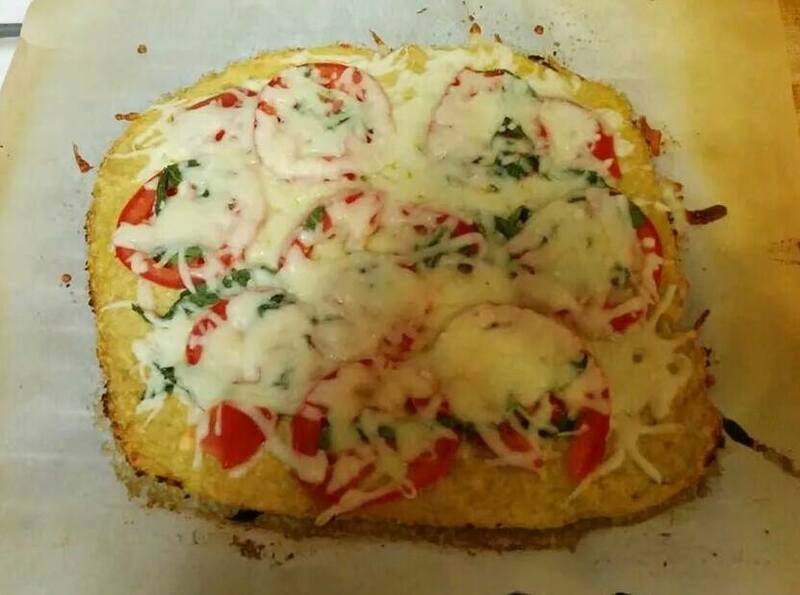 We went with the cauliflower crust that everyone has been raving about. It was simple and tasty, although many dead Italians are, I’m sure, rolling in their graves at the nerve of us calling it PIZZA. Using salted water, steam cauliflower for 15 minutes or until really tender. Remove from heat and chill. In the bowl of a food processor put cauliflower and process until finely chopped, it look kind of like rice. 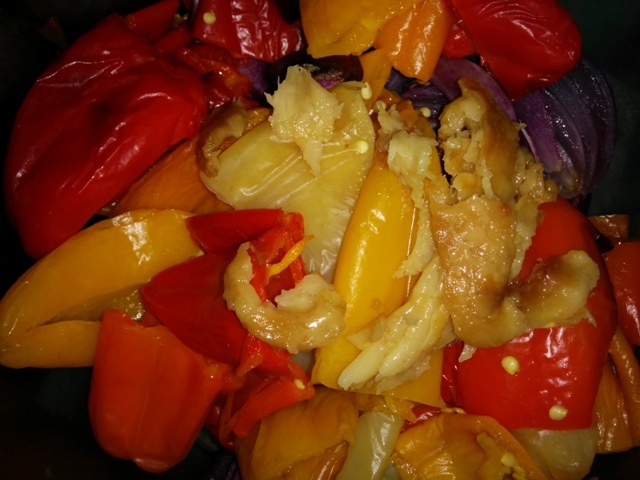 Mix cauliflower with remaining ingredients. On the parchment, pat the dough out into a 12 inch ‘circle’. Bake 20 minutes until golden brown. Add topings, then bake until cheese melts. We both agreed that this should not have a heavy red sauce, the sliced tomatoes worked well. Ours was topped with sliced tomatoes, basil and mozz. Saturday afternoon I received a message from Neil Hutchins of Committed Canines Dog Services, the company I work under. He had a new client that would be a challenge as well as a blessing. Autumn, a young girl, very ill, who needs a service dog to help alert to seizures along with other medical issues and to help to calm Autumn when she is agitated. There was no time to do any research prior to our initial consult. Arriving, we met Dawn and Johnny, parents to six children. Their story is amazing, heartwarming and heartbreaking. 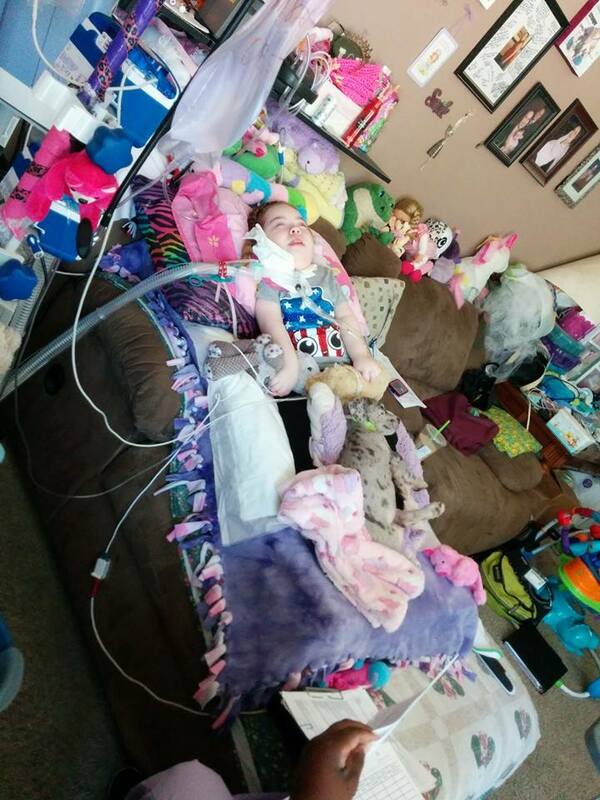 You can read more of her story here at her Facebook page at Autumn’s Mito Fighting Angels . Dawn, wanting to find another way to help Autumn and their family respond to Autumn’s medical needs, researched service dogs and their use in this specific situation. She then started looking for someone to help train Mito, their new Great Dane puppy. Others said that no, a dog cannot be trained to detect seizures Neil said yes, they can. And we will do it. I will work with them on basic obedience and some problem solving. The training for the service dog tasks will be done by Neil and Dawn. This training will include capturing as well as virtual conditioning. Mito, named for Autumn’s disease (please check the link to her page for more information on that) is still very young but has already started building the bond and prefers to sleep next to her or on a leg. Our first visit was mostly asking questions to determine exactly what they need Mito to do. We had the pleasure of meeting a wonderful family and a special little warrior. I am honored to come along on this journey. I immediately noticed upon cutting them open was the large concentration of inedible seeds. The seeds were easily scooped out, tho, and I took a bite of the juicy flesh. It’s a different taste, hard to explain, but sort of a savory watermelon. 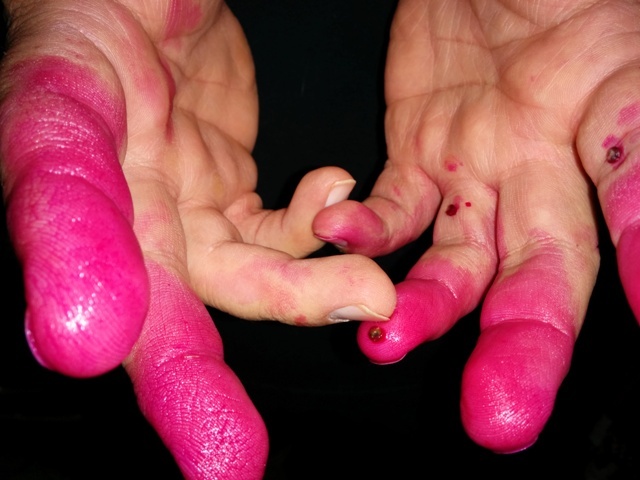 And the lovely dark pink/purple color juice went everywhere. So I conned hubby, my sous chef, into seeding the prickly pear fruit. 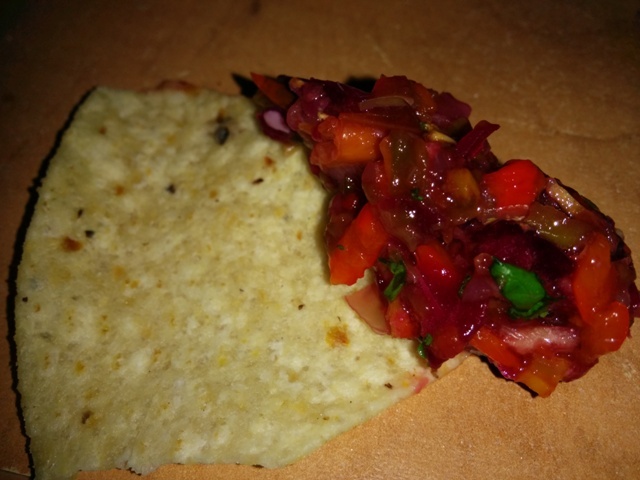 With a little thought I decided the flavor would play off nicely in a sweet/heat salsa. 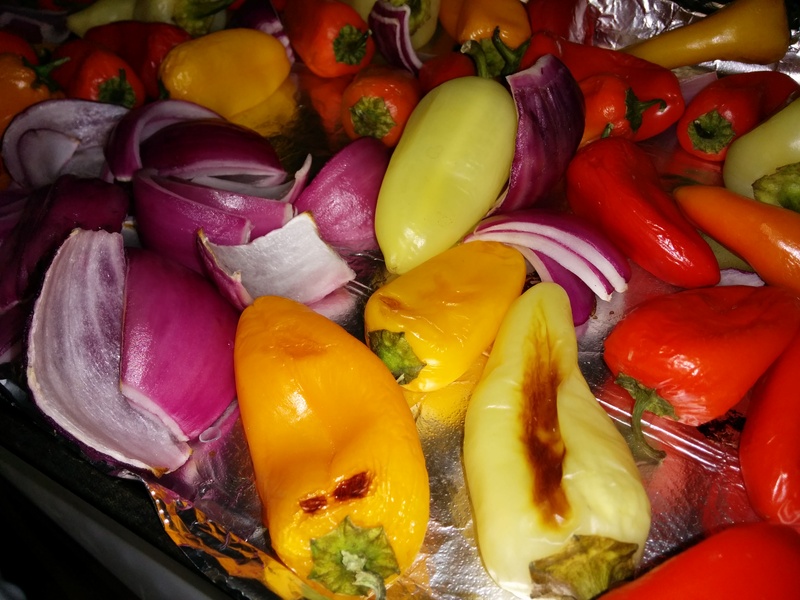 To get the sweetness I wanted I roasted a 2 pound assortment of hot and sweet peppers, garlic and red onion. Processing in the large bowl of a food processor, and working in batches, I whizzed all the veggies & a good handful of cilantro. 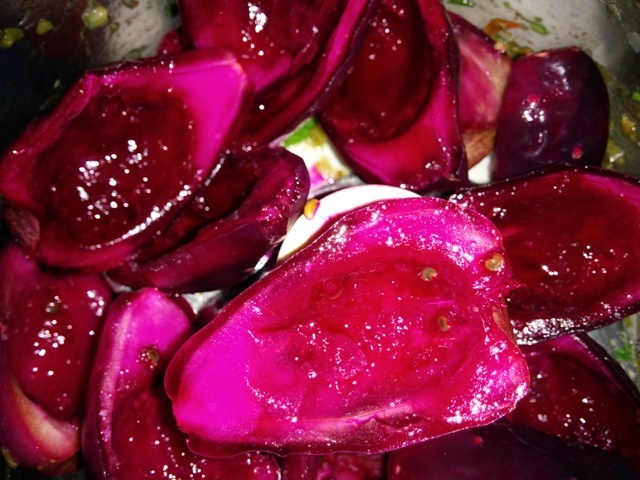 Andrea has promised us more prickly pear fruit and I am looking forward to trying out some new recipes. 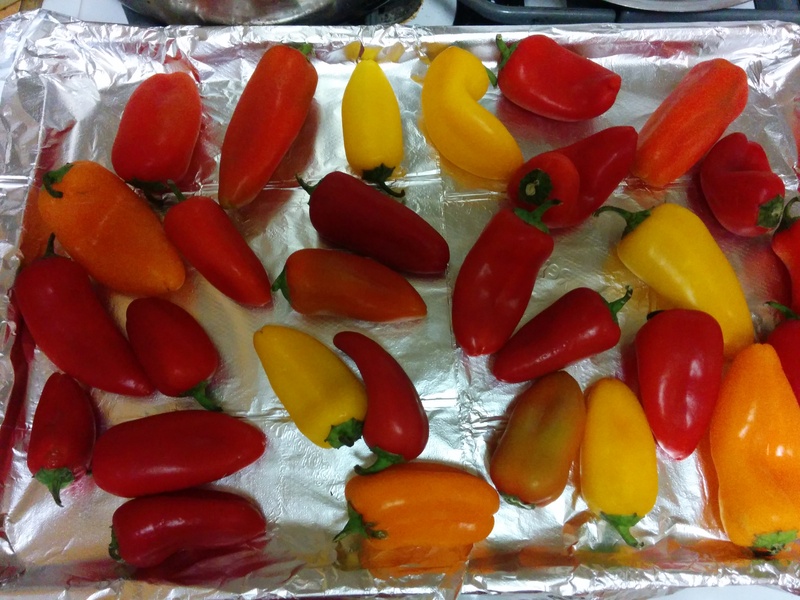 On large baking sheets arrange peppers and garlic head in a single layer. Peel the onion and cut in 1″ sections, arrange on baking sheets. Roast at 350 for 30 minutes or so, turning halfway thru. 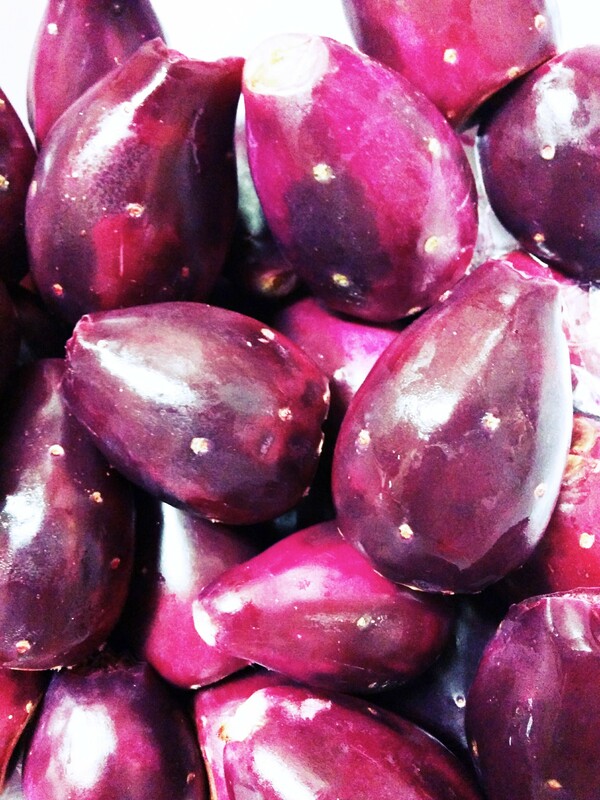 Prepare the prickly pear fruit by removing the thorns, slicing in half and scooping out the seeds with a spoon. 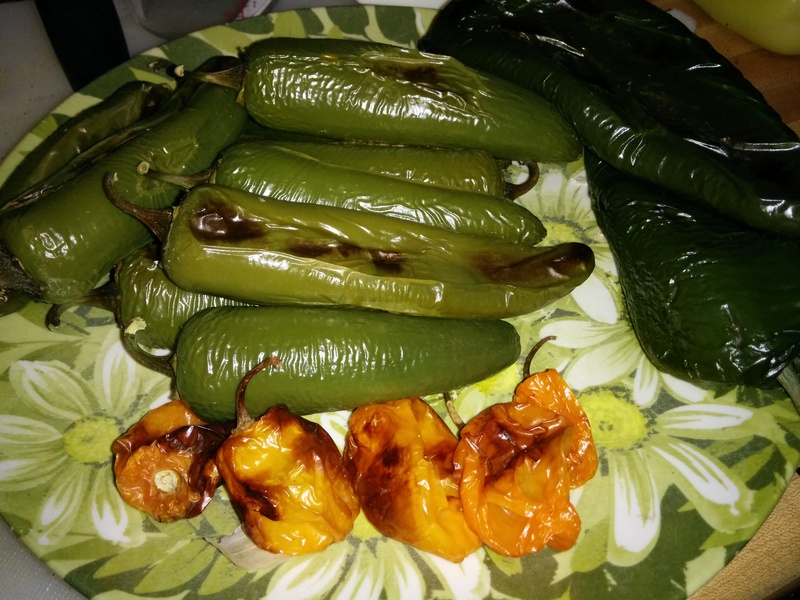 In batches process the peppers, garlic, fruit and cilantro leafs. Mix in a pinch of salt. Chil at least 6 hours for the flavors to meld. 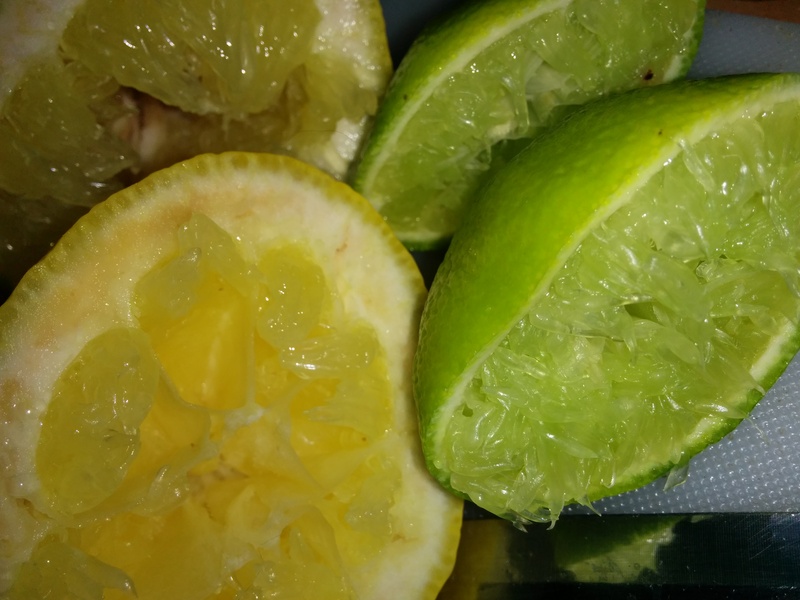 Garnish with slices of lemons, limes, prickly fruit and cilantro leafs. Hubby had some not-so-good news last week when he went for his doctor appointment. He was told he is pre-diabetic, which wasn’t all that surprising. Like many of us, he has been battling his weight since retiring from the Navy. At one time we kept a very healthy diet. Lots of white meat, veggies and no sugars. Over the last few years those habits had slipped away. Time was a big factor, we were both working long hours and then my medical issues kept me off my feet for any period of time. Well, now its time to pay the piper. First thing I did was as my food friends, whom I’ve been chatting with online for almost 20 years, for suggestions and advice. As always, they came thru with some tried and true lifestyle changes. 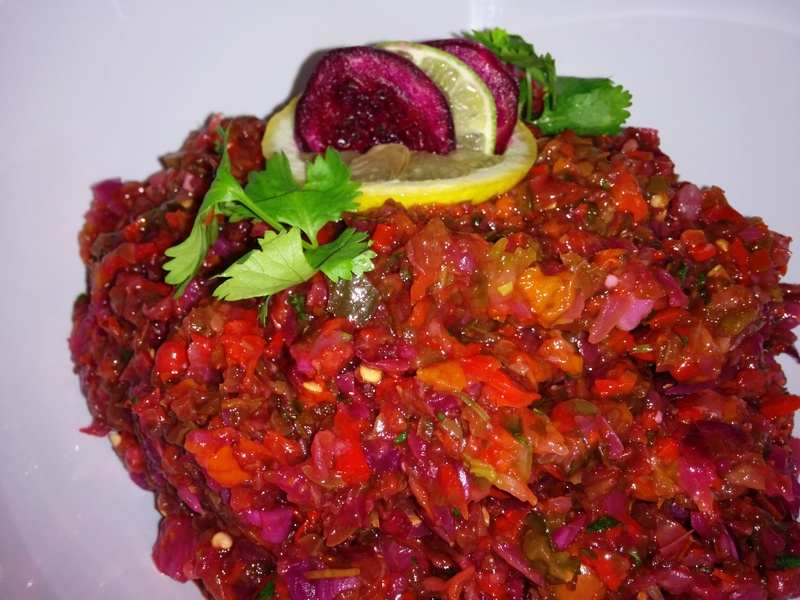 This past week I worked hard at making healthier dinners that are filling. 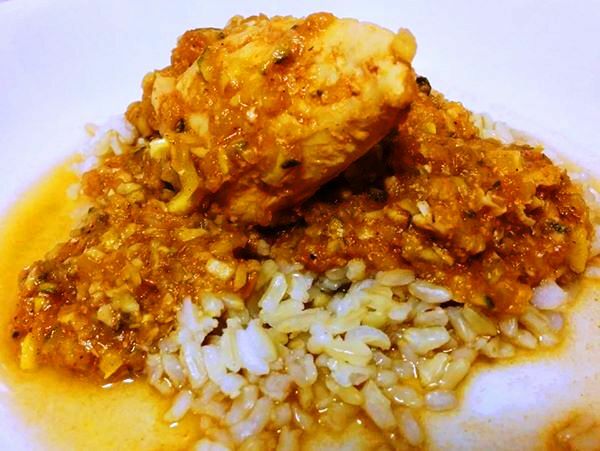 First up was Chicken in a Summer Squash Sauce, served over brown rice. I went looking for a recipe that included chicken and zucchini since that was what I had on hand. After looking at several for inspiration I ended up going a different direction with it. Combine seasonings in a small bowl. Sprinkle half over chicken tenders, reserve remaining. Chop onion, garlic, squash, zucchini and place in the bowl of a food processor. Add tomatoes and reserved seasonings. Pulse to desired texture. In a large skillet heat olive oil over med-high heat. Brown chicken on all sides, set aside. Add sauce to pan and bring to a simmer. Add chicken to sauce, bring back to a simmer and cover. Cook on low for 45 minutes. In a large skillet heat olive oil med-high heat. Brown chicken tenders on all sides, remove to a plate and cover loosely with foil. A common practice at our local shelter is for folks to tie a dog to the shelter’s gate while closed. This is very dangerous as it leaves the dog vulnerable and unable to defend itself from the coyote that live in the surrounding desert. 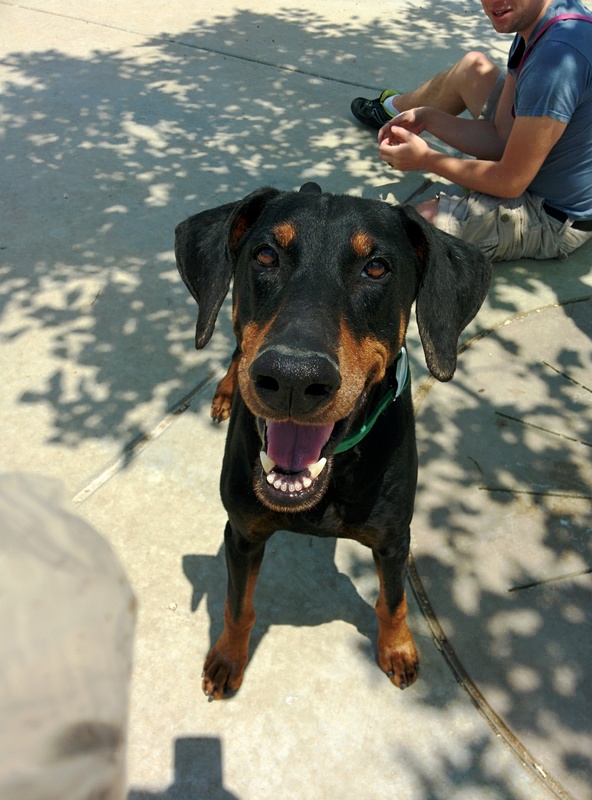 A few weeks ago the staff arrived one morning to find a sweet, well-mannered senior Doberman. There was a message on the answering machine telling them his name was Noah. Noah had obviously been taken care of as he was in good shape, was well trained and very sociable both with people and other dogs. 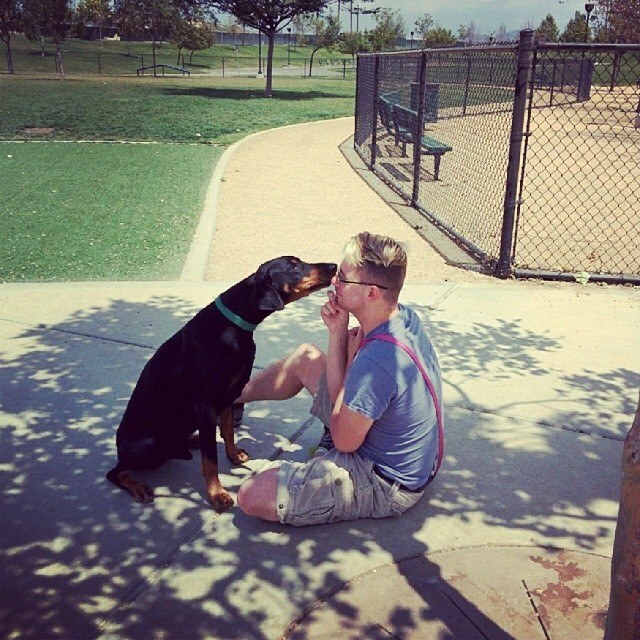 Contact was made with a Doberman rescue here in southern California and arrangements were made so that Noah could live at the sanctuary after being neutered to take care of an enlarged prostate. 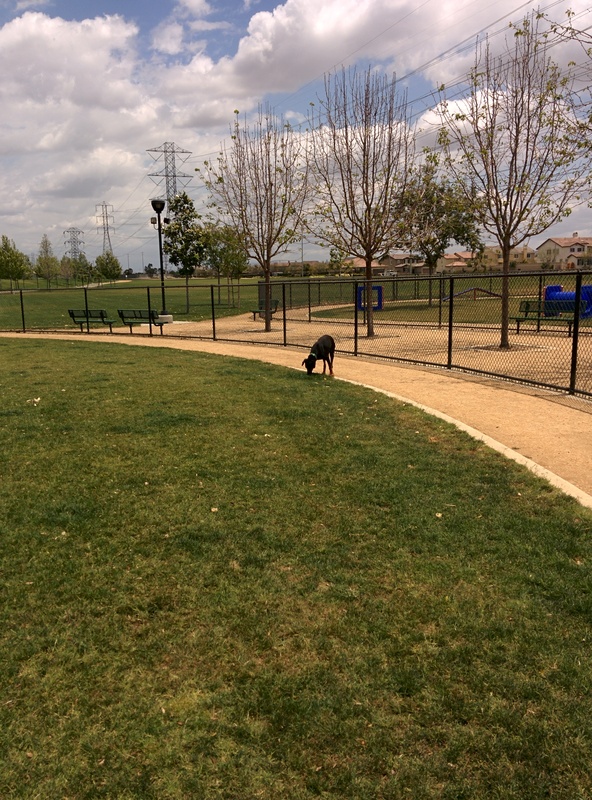 Travel plans were made to meet a representative from the rescue at a dog park midway between us. Neil, of Committed Canines and I headed off this past Tuesday, Noah in the backseat. Noah was an excellent traveler, watching the scenery as we drove the 90 miles. At the dog park Noah we allowed to play while waiting for the rep to arrive. This dog had a blast running around, sniffing and enjoying the interaction with Neil and I. There were also lots of treats and a ‘picnic’ lunch of kibble. Because of a bridge fire the rescue rep was running late so we enjoyed our extra time with this sweetheart. All too soon it was time to say goodbye to Noah as he left for his forever home, a 6 1/2 acre sanctuary where he would be free to roam and play all day and sleep inside at night. I plan to be involved in a lot more happily-ever-after endings. Hubby’s schedule changed recently. He’s now working three 12-hour days along with his callback schedule. This schedule change has really impacted our lives in several ways. Because he no longer will be working an 40 hour week his pay is reduced. Because he is working longer days he is eating dinner much later. I need to come up with meals that are lighter and that can “hold” from the time I eat around 5 to when he eats around 8. This week’s menu included turkey sloppy joes with baked potato salad. I made the turkey Sloppy Joes using the same recipe as beef, substituting ground turkey for the ground beef. The baked potato salad is a recipe I spent several years trying to perfect. My first taste of this salad was from a little grocery store up the street from us when hubby was stationed in Bremerton Washington. After relocating cross country I tried to replicate it, just going by memory (and no internet to search back then). It wasn’t until I tried a 50/50 split of mayo and sour cream that I had a winner. 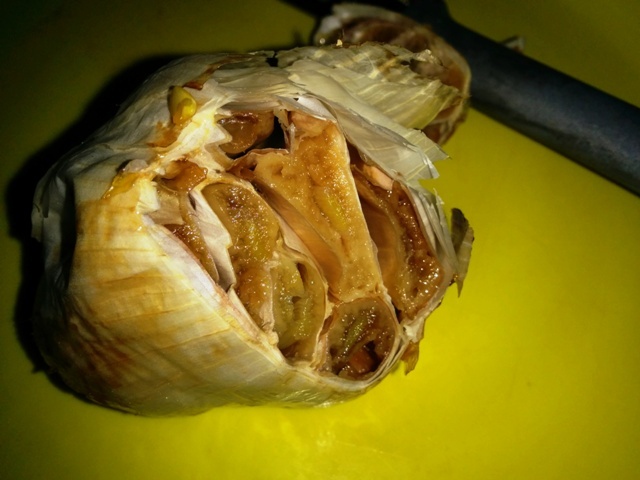 And if I have roasted garlic I will add that to kick it up another notch. Wash and dry the potatoes, then rub potatoes with olive oil and season with salt. Bake in a 350 degree oven until done. 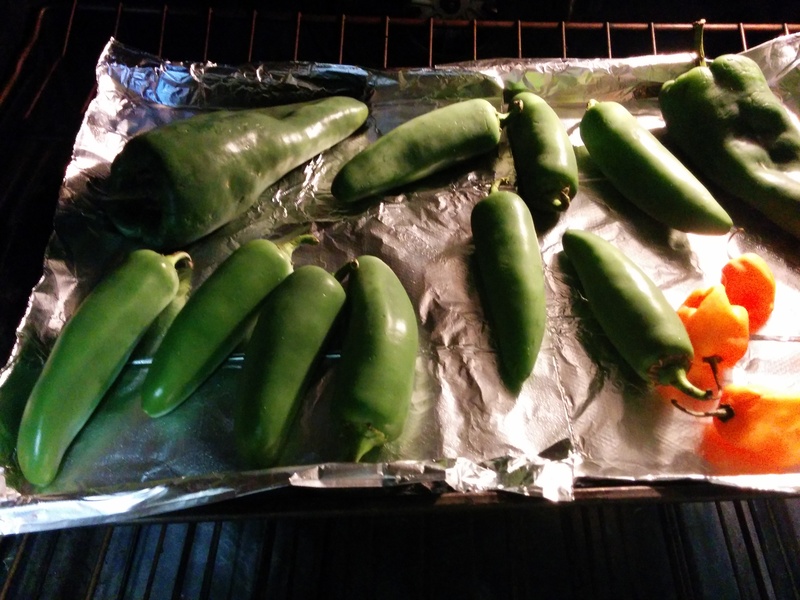 Remove from oven, let cool and dice in 1-inch chunks. Set aside. 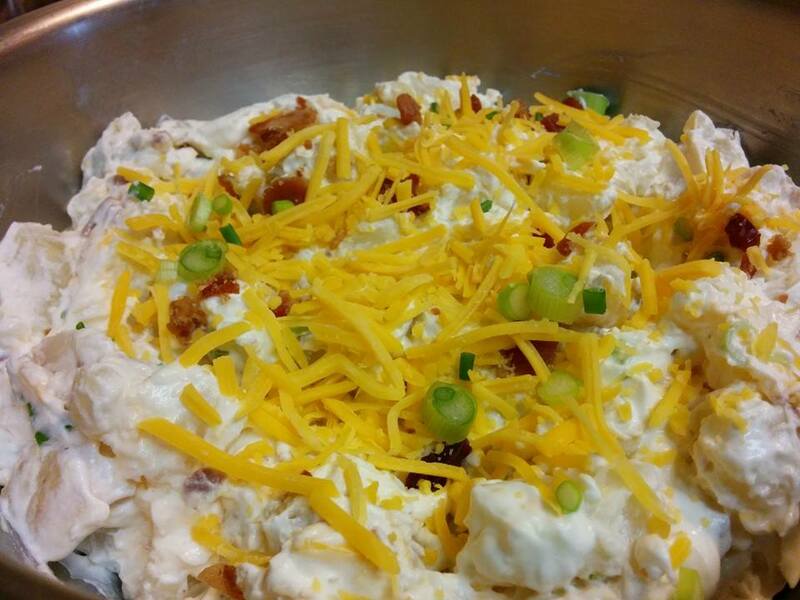 In a large bowl, mix together bacon, scallions, cheddar cheese, sour cream and mayonnaise. Mix in potato chunks and season cracked black pepper and salt. Leash corrections are easy to use but, in the end, the dog only learns that the handler has issued a painful or uncomfortable correction. This then becomes a fear imprint, not a learning experience. The dog may become afraid of what causes the correction (ie, reaction to another dog). The dog then will turn out to be reactive to other dogs not because he doesn’t want to be ‘friends’ but because he fears the correction that he is now conditioned to expect. What the dog has not learned is what the appropriate, or correct, behavior should be. This problem is compounded when corrective collars such as prong (pinch) collars or choke (check) chains are used. Yes, in the beginning the dog may respond to the correction but, after time, the dog may start to react to his fear of the correction. My theory of why this happens: If you were smacked every time another person walked by you might start to react to seeing another person, even at a distance, because you know a correction (a smack) is coming. You reaction may be to yell at the other person to go away but what actually happens while you are warning them away? You get smacked repeatedly until you stop yelling, which coincides with when the other person is no longer visible. The dog may be thinking the same thing. He’s warning the other dog off, telling him to go away, because he now knows that the correction isn’t going to stop until the other dog is gone and he no longer has to warn him away. Therefore, in his mind, his warnings are working because the other dog is no longer visible and the corrections have stopped. The only hard data or facts I have to prove this is that since I no longer use any harsh methods my dogs are more relaxed AND reliable. I am coming away from this school a better person all around, not just a better trainer.